Yesterday, I took my wife and daughter for Holy Mass at St. Matthew Church in Central Falls, Rhode Island (pictured at left). It's actually the first time I've been in St. Matthew's since around 1991-ish. Still quite the nice church, and I'm happy to say that the altar rail is still fully intact. 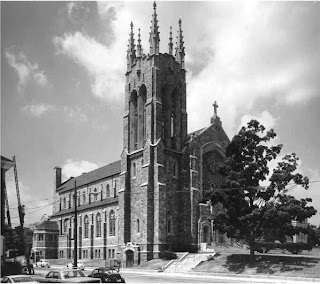 St. Matthew's was established in 1906 for Catholics of French-Canadian descent. I can recall even in the 70's a Mass schedule that consisted of four English Masses and two French Masses, and the front page of the parish bulletin was headed with the words "Eglise Saint-Mathieu". Holy Trinity Church closed its doors in 1989, and was demolished shortly after. The pipe organ, a 1917 Cole and Woodberry two-manual tracker of about 27 ranks, was moved to a Presbyterian church in Wheeling, West Virginia. I was very elated to learn that that organ is still in use. From the time the church closed up to the merge ten years later, Holy Trinity held Masses in the lower hall of the former parish school. Notre Dame just closed its doors last summer. That building is still standing at this point. The pipe organ, an old W.K. Adams instrument to my understanding, was destroyed when that church got a face lift in the early 1970's, and replaced with an Allen electronic instrument. Holy Trinity and Notre Dame merged with Saint Matthew's around 1999 to become the "Holy Spirit Catholic Community". Unfortunately, since the untimely death of St. Matthew's then-pastor, Fr. Donat Tremblay, in 1988, the line of pastors to follow have been of the progressive lot - with the pastor to succeed Fr. Tremblay probably doing the most damage. The Worship II hymnals were taken out of the pew and replaced with WLP's We Celebrate, only to be replaced again shortly after - by the same pastor - with the OCP Today's Missal/Music Issue. In the late 60's, a three-manual Austin console was added downstairs in the chancel area, also controlling the entire organ. In the early 90's that console was replaced by a rebuilt Aeolian Skinner console, also a three-manual. Because of wiring difficulties, the four-manual Casavant console upstairs landed up being disconnected. The current chancel console is prepared for the time that the "Aerial Organ" may someday get fixed. Anyhoo, here's the music that was sung at the 10:00 Mass yesterday for the Solemnity of Christ the King. You may gag at some of it, but if the organist had his way (and he's quite good), it would be far more traditional. Obviously the opening and closing were of the good solid Catholic variety. To Jesus Christ, Our Sov'reign King..."Ich Glaub an Gott"
Let us go rejoicing to the house of the Lord, and matching Alleluia...Alstott, from "Respond and Acclaim" (the alleluia was the one in D where the melody ends on the fifth). Crown Him with Many Crowns..."Diademata"
PS: Central Falls does have one other parish, Saint Joseph, a very active Polish American parish established the same year Saint Matthew's was established.